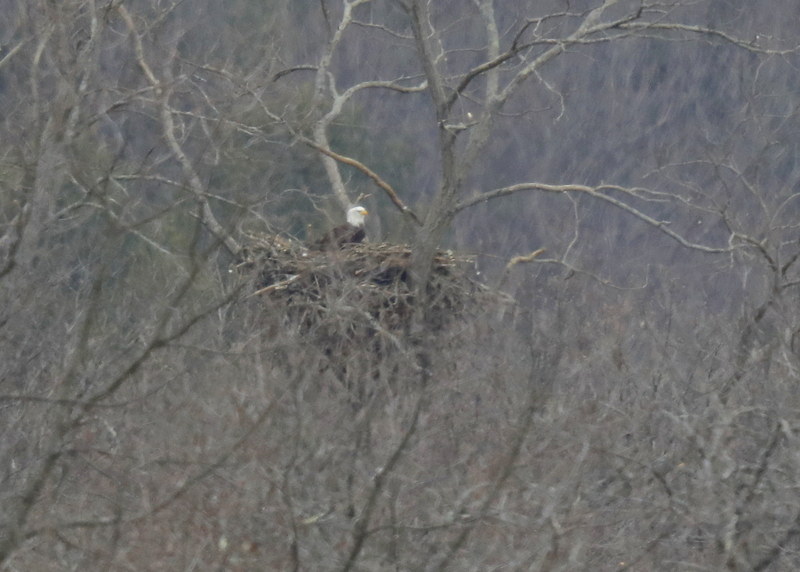 You are browsing the Blog for bald eagle on nest merrimack river. 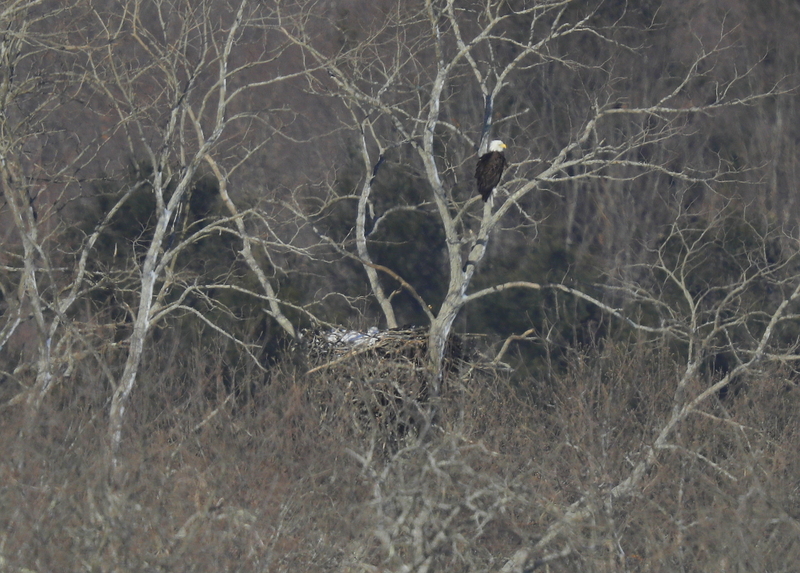 The 3 Bald Eagle chicks continue to grow in size and shape. 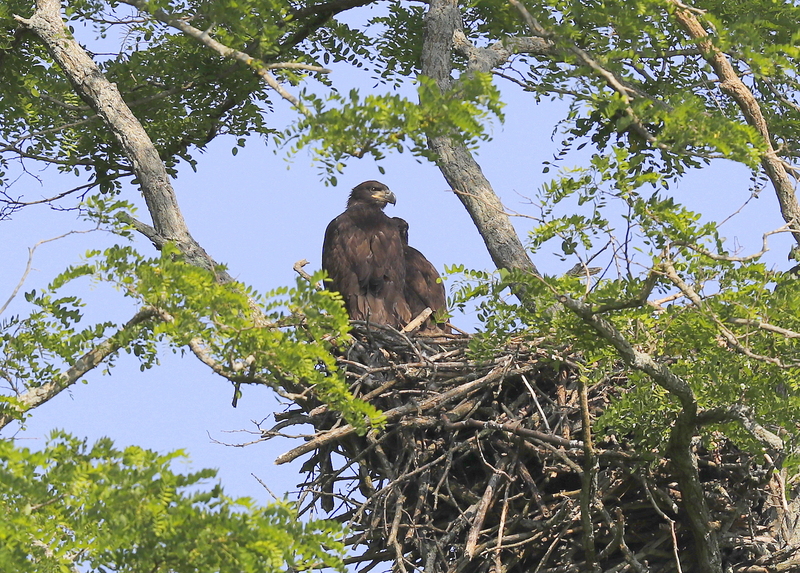 Adults will feed their chicks directly until the eaglets are five to six weeks old, when the young are able to tear pieces of food off and feed themselves. By age 5 weeks, male and female parents bring relatively equal amounts of food. Parents begin spending more time away from the young and often perch in nearby trees. By six weeks the young are able to stand and walk, and by seven weeks maximum body growth nearing completion. At eight weeks, they are at their hungriest and are ready to fly by week twelve. By the time chicks are 9 weeks old, they are fully grown. Chicks continue on the nest gaining strength for 10 to 12 weeks. 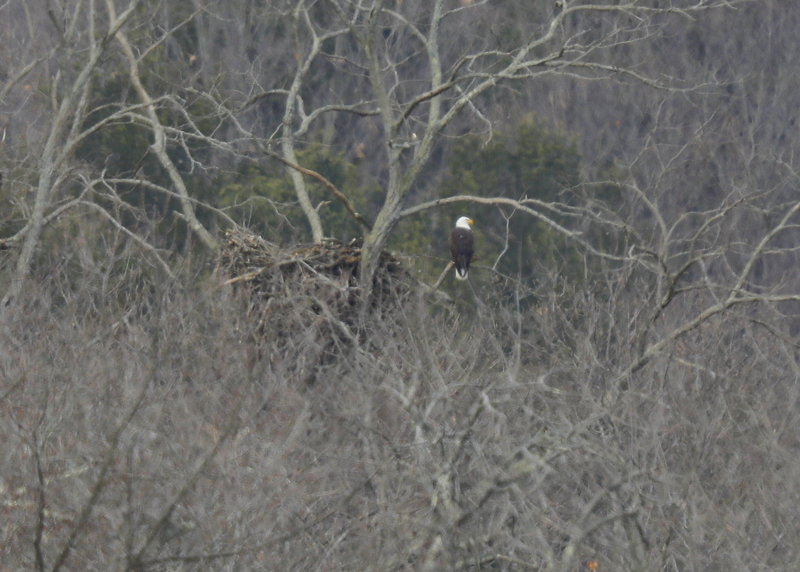 A lovely sight to observe this female Bald Eagle on next with eggs. She is hunkered down in the nest and takes infrequent trips away from nest for quick bathroom breaks and feeding runs. Throughout the 33-35 day incubation period, one parent is always on the nest, not only to keep the eggs warm but to protect them from squirrels and gulls which would relish the chance to break open and eat the eagle’s eggs! Observed the male perched adjacent to the nest with the female hunkered down after the big snowfall. Incubating eagles will sit on the nest almost continuously. The eggs need to be maintained at a temperature close to 105 degrees Fahrenheit. Adults share incubation duties. Nest exchanges may occur after only an hour but usually take several hours between exchanges. Frequently the incoming adult brings a new branch or fresh vegetation for the nest, then the incubating adult carefully stands and takes off while the other settles over the eggs and rakes nesting material up against its body. During nest exchange adults may both be in nest or sometimes one adult may leave eggs unattended for a few minutes before the other adult arrives and resumes incubation. The first nest exchange of the day often occurs at or before sunrise, with next exchanges following every 1-4 hours. For Bald Eagles, eggs must be kept warm, shaded from harsh sunlight, and protected from predators. In addition to incubating, the eagles also need to turn the eggs about once an hour to ensure that the eggs are evenly heated and that the embryos don’t stick to the insides of the shells. When turning the eggs, the eagles often balled up their talons to prevent their sharp claws from puncturing the eggs. The eggs are rolled over by either parent about every hour to 2 hours during the incubation period. The purpose of this roll is to make sure that the lighter yolk does not rise to the egg surface and the delicate blood vessels that cover the yolk touch and stick to the shell surface, killing the developing chick.The brood patch is an area of bare skin on the bird’s breast that is formed when the bird removes its own feathers. By removing the feathers the parent bird allows his/her body heat to better reach the eggs and keep them at the proper temperature. The female was observed late afternoon rising above the level of the nest while she was doing her egg turning thing, providing nice looks! Not sure if the female is hunkered down deep in the nest with the male perched next to the nest. Sure looks like they are ready to lay eggs and begin the incubation process! This Bald Eagle nest, like most others, is constructed from large sticks, which are laid together to form the outside part of the nest. The center of the nest is filled with dead weeds, stubble and other softer materials, which may be available in the area. The nest cavity where the eggs are laid is lined with grass, dry moss and feathers. Many Eagle experts believe that some bald eagles show such a strong attraction to their nesting site that, if displaced or overly disturbed, a pair may not return to the nest the following year. This fact places great importance on protecting nesting areas from disturbances such as land development and recreational activities. This new Bald Eagle nest may well be used for the first time in 2017. 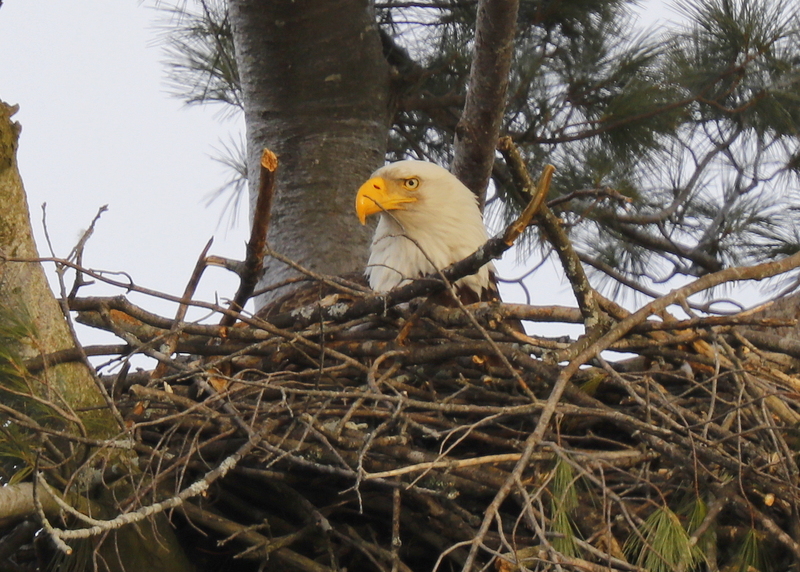 The nest was completed in the fall of 2015 and the Eagle pair spent a great deal of time around the nest in the spring of 2016. But it appears that no eggs were ever laid. This “playing house” is not unusual among a newly formed pair of Eagles. It has been stated for many years that a Bald Eagle pair will mate for life, but if one partner dies, or disappears, the other will if lucky find another mate. A newly bonded pair may work several years on a nest before actually breeding. They may desert one nest site and start again somewhere else, usually within 1/2 mile. 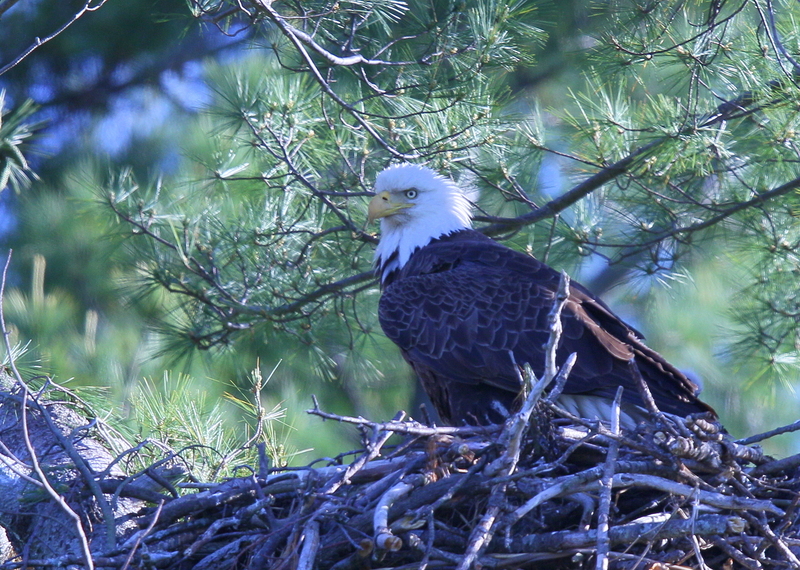 In Eastern Massachusetts, bald eagles will begin to nest sometime in February or March. Each nesting pair will spend a great amount of time preparing the nest before any egg is laid. The successful nest is generally located in a large tree, within one mile from water, either a lake or river, where adequate food is available. Bald eagle nests are generally found from (50 to 120 feet) above the ground, in a tall, sturdy tree. It takes at least two weeks for a pair of eagles to build their nest. 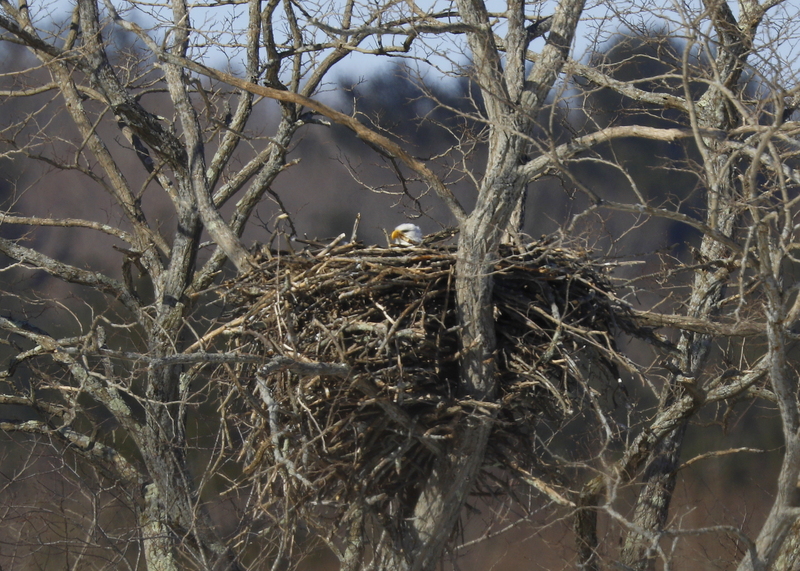 A typical bald eagle nest will range from 6-10 feet in diameter and about 6 to 10 feet high. The nest cavity, where the eggs are laid, will be about 12 to 16 inches in diameter and about 4 inches deep. A pair of eagles, once established, may use the same nest several times over a period of years. Each year more materials are added to the nest, which increases the size of the nest each year that it is used. Nests weighing up to 2 tons have been found. Stay tuned!